Erik Ievins grants himself an exclusive interview. editor's note: When getting to know someone like Erik, you never really know what's going to happen next. One thing you can be sure of, though, is that sooner or later, his inner child will surface. Being around such enthusiasm, energy, and love for the rest of the universe can be a little unsettling but then quite contagious... and when your own inner child is encouraged to join the fun, as it inevitably will be, this writer implores you that life's too short to miss a minute of it. Erik- Let's start with the most important issue. WHY do you love old Valiants so much? Erik- (laughing) Good question. It's a passion, to be sure, and a focused one at that. As with any matter of the heart, there are times when it skips a beat or two... I don't always understand why, but I know that it happens. I've finally figured out the secret to making life happier: why fight it? Erik- OK, then where did the passion come from? Erik- Ah, that's easier. It was pretty much by accident. 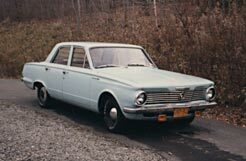 My parents had a 73 Valiant while I was growing up, and certainly taught me the beauty of function over style. Taught me how to take care of things, too. There are lots of memories: we could fit a family and tents and sleeping bags and a cooler of food and a propane stove... Dad taught me how to pack a trunk full, with not a cubic inch to waste. 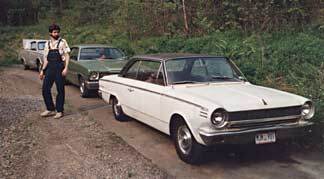 Especially as I grew toward teenage-hood, I was very impressed that nothing ever seemed to go wrong with that car, nor any slant 6 cars I knew about. Unlike many kids, I was way too practical to care about a flashy sports car. 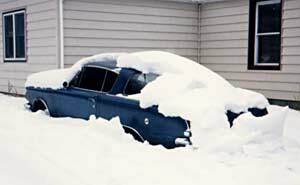 But my hopes to inherit the family sedan were dashed by the salt of all those Northern winters, and the fact that my folks never get rid of anything until it has absolutely no use left in it at all. Ultimately, I vowed to find another one just like the 73. Erik- The 73 Valiants are so incredibly square, compared to these 64-65s. How did you change your target? Erik- Another accident. As an underpaid teeny bopper in the 80s, I couldn't afford any of the 70s Valiants or Darts for sale. A 65 Valiant in the paper for $150 caught my interest. Didn't really know anything about it, including the fact that the grille was actually from a 64... so asked my friend Colleen if I could borrow her Dad for a few minutes. (It was pretty well known that, when it came to Plymouths, he was either a doctor or a magician.) After a quick sniff of all the fluids and listening to it run for 20 seconds, he turned it off and pronounced, "It'll be fine. Throw some Bondo in the rust holes, and just drive it." At the time, I had no idea how he could be so sure, so quickly... but he was absolutely right. It took me years to figure out how he could correctly identify the engine size as the baby version, with nothing more than a 2 second glance under the hood. Nowadays I realize that the one-inch difference in engine height is subtle, but noticeable. He was goooooooood. Erik- So did you "just drive it?" Erik- Of course not. Like any teenager with a new toy, I spent an entire summer plastering it with attention. Got a new grille and some body panels from the junkyard, I riveted sheet metal patches in the floors, and I got really good with fiberglass body filler goop. Slapped a little paint on a few spots with a foam brush, and overall, it really didn’t look that bad. 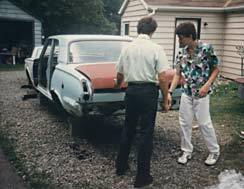 And with the help of a couple of older friends, I learned an awful lot about tune ups and minor repairs, as well as how to buy a car differently next time. One thing I don't regret at all: I had so much sweat equity in that car, I wouldn't dream of doing anything risky with it. Unlike some kids whose parents gave them cars, I realized the value of what I worked for. 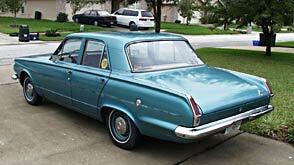 I originally thought the 65 Valiant would be a suitable substitute until I could find an affordable 72 or 73 (which I did a couple years later,) but I soon came to realize that I actually preferred the rounder styling of the older generation, so I went back to it. The 65 was a car that could arguably be called cute, and the little slant 6 engine ran like a top. The girls who were looking for guys with flashy cars were not on my radar screen, anyway. Erik- Were girls ever impressed by your wheels? Erik- Only a few, and they were more impressed by running condition than looks. I still recall my friend Allison's thoughtful comment, when I openly wondered how she didn't mind riding with me in a ratty old bomb... she said, "Erik, if you say it's safe, then it's safe. That's all I need to know." Although I must admit that even she probably liked the red one the best. Most of my friends did. People are attracted to shiny things. 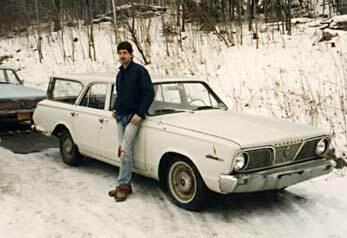 On the other hand, I remember people's reactions to the 66 Valiant wagon I had once, which was undoubtedly the most useful, but also undoubtedly the ugliest car I've ever owned. I learned who my true friends were, but even they gave it nicknames such as the Hearse, and my favorite affectionate title, the White Rat. One time, a friend hesitatingly asked me to park it down the street a few houses away. We still laugh about that funny story, even today. I've come to realize that I really do like the utility of the Valiant wagon, but the rounder looks of the older ones are much more pleasing. The 64 is nice, for example. I'd love to get one of those. Erik- It sounds like you've seen a lot of these old Valiants, then. Erik- In those years, it was easy to find a cheap 15- or 20-year-old bomb that needed work, (unlike today when they're 40-year-old expensive antiques that need work.) I guess you could say that I always had whatever the equivalent is of a green thumb, working with machinery. (Would that be a greasy thumb? I dunno.) I was able to learn mechanic's skills little by little over the years, and ultimately return the favors I had received earlier, by helping friends who needed bombs to drive. Well over a dozen Valiants and Dusters crossed my path, got fixed up, driven for awhile, and then went on to make someone happy. Sometimes I even branched out to other vehicles. 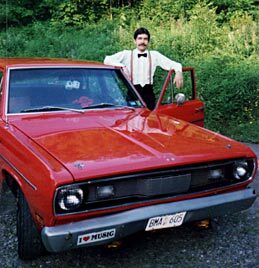 My parents were amazingly tolerant of my part time shade-tree mechanic business... but of course sometimes I fixed their cars, too. I rarely charged any money for anything other than just parts, which I wonder now might have been foolish. I just wanted my friends to be taken care of. 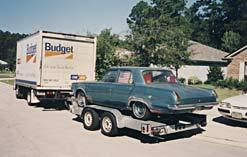 Erik- So the Valiant is a family icon of practicality. How about Barracudas? Erik- Yea, aren't they cool? 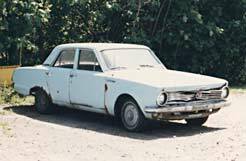 The first time I saw one, I had to be convinced that it was mechanically identical to a Valiant, underneath. When I realized a Fish was likely to be every bit as reliable as the boxy sedan, I bought one, and my life has never been the same since. I was, well, hooked. That back window is incredible. The thing I remember most about it is that it stays completely dry in even the heaviest of rainstorms, as long as you're moving at least 30 mph. That's gotta say something about turbulent or laminar flow, though I don't know exactly what. And thanks to a ventilation system with an exit by the trunk hinges, enough air moves across the inside of the glass that it never fogs up. Absolutely amazing. 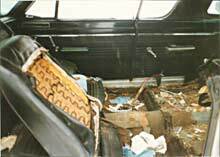 Of course, I also learned that although there's probably enough room to put a full-sized refrigerator in the back with the seat folded down, none of the openings are big enough to get it in there. Back and forth to college, I carried lots and lots of stuff, packed with no cubic inches to spare, but it had to be in comparatively small containers so I could get it in and out. Erik- Sounds like a great college car. Erik- It was. Although, all things considered, we were relatively polite college students. We had a great deal of fun with that Flying Fish... my favorite story is still the time when a bunch of us went through the McDonald's drivethrough in reverse. Hee hee! That car was easy to back up, since there was so much visibility out the big window... and I'd had a lot of practice maneuvering all kinds of vehicles around my parents' curved driveway... the real reason, though, was that my passenger riding shotgun was the only one who knew what she wanted, so I pulled in backwards to put her next to the microphone. That was a blast. Erik- Tell me more about your famous Flying Fish. Erik- Ah yes, my first serious experience with a V8. Not that the slant 6 engines were ever lacking any power, in my opinion, but this thing positively moved. Well, it did after I got it running, that is. It was a huge learning curve. 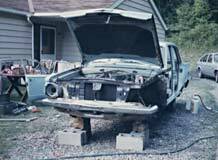 When I found that gray 66 Barracuda, the body was solid, but not much else. It was being used as a garbage dump in a farmer's field, and served as hotel to six generations of mice. It fired up, ran, but ticked and thumped a little. Optimistically, I got insurance and plates, and attempted to drive it 25 miles home. I learned that it knocked a little more when it warmed up. Banged severely when fully warm. I left it by the side of the road, came back later to tow it the rest of the way. More than a few people got a good laugh at me... but I guess I had a dream of what it could become. The remaining 8 years of ownership went much the same way, although the breakdowns occurred with decreasing frequency, and my ability to repair and get back on the road to my destination increased a little each time. 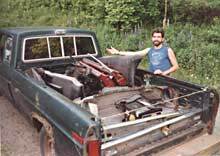 My trunkload stash of tools and fluids never ceased to amaze most people. I learned all about engines and Ujoints and brakes and turn signals and fuel pumps and hoses and wheel bearings and on and on.... Had to tow the thing home only a few more times. Not long afterward, friends decorated it to wish it well. 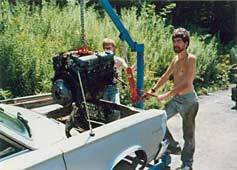 It took awhile, a couple of engine swaps, and numerous repairs, but eventually most of the car was in pretty good shape, and it would go literally thousands of miles before needing any minor attention at all. Eventually, I even painted it my favorite color turquoise, and then it looked pretty good. The "66 Fish" license plates were a hoot, too. In hindsight, after doing all that work, I wish I still had it. Erik- So why don't you? Erik- *sigh* It was an attempt to pacify a girl who made no secret of the fact she thought it was ugly. I might even go so far as to say she truly hated it. Can't remember if she ever rode in it, but I do remember one time when she outright refused, preferring to walk a mile home, instead. Sheesh. And rather than interpret this event (among many) as a sign of our compatibility, I ultimately decided I was unwilling to break off an engagement over something as petty as a car. Erik- Yea, can you believe it? I sold not only that car, but a couple others, and an entire basement full of spare parts. A few friends wondered if I'd been hit on the head recently... I guess we do strange things while in love. Believe it or not, at the time it made sense. I was willing to do whatever it took, even to the extent of changing bits and pieces of my personality, for a chance to earn her undying gratitude. [Erik pauses, then grins...] It wasn't very effective, I guess. 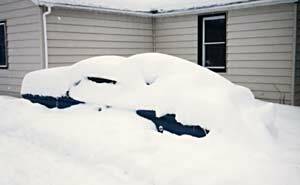 On the other hand, I'm happy to say the cars went to good homes. And even better, the experience gave me a chance to learn a lot about myself. It's interesting: although that modern, shiny fuel-injected thing came into my life largely because of her encouragement, and it initially scared me a bit, over the years I've slowly gained an appreciation for computerized vehicles, as I see how precisely it's possible to get them to run. My brain has done a lot of things and been a lot of places I never would have predicted. Erik- And your heart, too? Erik- Yea, it's still thumping, as resilient as ever. I keep learning more about how to follow it, regardless of what people think. Part of my heart truly enjoys antique mechanical things. Part of me enjoys simplicity. The hobby of an old car fits both bills, pretty well. A couple years ago, I finally found a sentimental reincarnation of that first car, fell head over heels all over again, and even sold an old Corvette Stingray to make room in the garage. I drove the little Valiant for awhile, and then decided I liked it enough to tear it apart and restore it, figuring maybe I can make it last forever. [pauses] So yes, I guess that means this is either a hobby or a mental illness, depending on your viewpoint. This restoration has been a slow process, since there are a lot of other interests on my plate as well. And of course, it's a whole lot more expensive to get parts now. A tail light lens is no longer $5 at the junkyard. For crying out loud, a few hundred $ used to be enough to buy a running daily driver, but now that will get you a bushel basket full of parts that someone believes has the potential to become a great car. Compared with the costs of rechroming, repainting and reupholstering, It actually might be cheaper to throw mine away and find a different car in mint condition. But I can't do that. This one is quite solid, and has too much use still left in it. Erik- And when you're done, it will be absolutely perfect, right? Erik- Until recently, I would have said yes. You know that. Everyone I know expects nothing less from me. But a recent wake-up call reminded me that the longer I keep that project on the back burner, the longer it will be until I can really enjoy it. In theory, life is too short to wait until something is perfect. In an effort to convince myself of that, I've put this at the top of my list, even ahead of the house project. Much to my chagrin, for the last couple of years this car's almost been more of a burden than a pleasure. I've dragged it around behind me when I've moved, and lately it's been buried in my garage under a whole bunch of construction materials... I've got a lot of work ahead of me. And I've set a rather ambitious goal of having it on the road by mid-September. 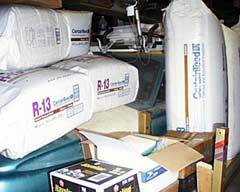 For the moment, all it needs to be is safe, reliable, and watertight. Beyond that, if it looks halfway decent, it'll do for now. Erik- Rumor has it that, after you dust it off and rebuild the entire brake system (and a few other things), you're even considering making this your only vehicle? Erik- (laughing) Sure, why not? Most parts are as close as the nearest NAPA or Carquest... and these old things are built so solidly that not much ever goes wrong, anyway. Although I have to admit I'm entertaining ideas of adding such niceties as fuel injection, overdrive, cruise control, intermittent wipers... I must be getting spoiled! Shoulder belts and head rests might be a useful safety improvement, as well. Sure, I love preserving originality, but preserving me and preserving the car is important too. Erik- What will your life be like when you drive this every day? Erik- Well, I remember the headlight flashes and thumbs up when I drove my old Corvette convertible, but a "plain" car brings slightly different reactions. This little Valiant causes all sorts of smiles and waves, and from a much wider audience. Maybe people think of this car as more real or more attainable than a shiny 'Vette, I dunno. The last time I took it out for a spin, with bodywork in several different colors of primer, a little girl nearly fell off her bicycle as she waved wildly, grinning from ear to ear. And I'm sure she didn't even know what it was, or that it was decades older than she was. Now really, what sort of new car can elicit that sort of reaction? They all look like rolling jellybeans or angry kitchen appliances. On the other hand, this thing has style. And if I can help cause a few more smiles in this world, why not? Isn't that really what life's all about, anyway? Erik successfully located the car in the garage and removed 2 years worth of dust, finished some bodywork on the lower extremities and used an airbrush to shoot some paint that almost matches the rest of the car. 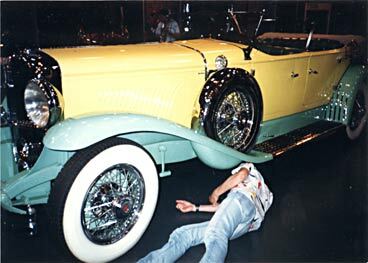 After attaching the waiting rechromed bumpers, taillights and doorhandles, replacing lock cylinders and a speedometer cable, rebuilding the entire hydraulic system and updating to a dual-reservoir master cylinder, tuning it up and replacing gaskets, lubricating and adjusting countless items, and finding insurance for it... he is currently driving it every day (well, when he doesn't ride the bicycle, that is.) "It's not done yet, but it sure puts a smile on my face to be in it! And the best part is the sense of accomplishment. Now I can put this project on the back burner again for a bit, and choose the next issue to tackle..."
Erik reports the car being a joy to drive, despite a lack of horsepower. Many of the vital signs (oil pressure, oil consumption) were still good, but with compression readings all the way down to between 60-70 psi, Erik relates, "I started to wonder if this was an experiment to see how far a slant six could be neglected and still run. Some cars would refuse to start in this condition, but an old Chrysler product apparently subscribes to different rules." The decision was made to rebuild... but then loomed the question of whether the task would be done before the annual summer Carlisle show... so, ultimately the car made one more round trip from Florida. "It had just barely enough power to get up the rolling hills of Virginia and Pennsylvania, with my foot to the floor, losing speed toward the top of every rise... Optimist that I am, even I started wondering if I'd pushed my luck too far, toward the end of that 1800 mile trip." Erik thanks Charlie tremendously for showing him how to do it. The rebuilt engine purrs like a kitten! A very active and playful kitten, at that. Of course, even a pure-stock rebuild would have made a night and day difference, but with minor improvements to balance and compression ratio and degreeing the slightly warmer camshaft, it feels fairly responive now. "This year's trip to Carlisle will be a little less nerve wracking, and a whole lot more fun. Yippee!" When he's not happily working on a million other projects, Erik builds and maintains this Web site for the club. Your stories, helpful hints, and suggestions are always welcome.